The Most Amazing Celebrity Private Jets and Yachts – You Won’t Believe the Lavishness! Most celebrities indulge in buying expensive sports cars, ones that most of us have only seen on magazine centerfolds. The most exclusive group has already surpassed this obsession with cars – they’ve committed themselves to conquer the seas and the skies. With luxurious private jets and yachts, they make heads turn wherever they go. So, what are the most extravagant yachts and private jets of them all? Let’s take a look at the expensive toys of the world’s elite. If there is something that John loves (other than Scientology), it’s aviation. Unlike most celebrities, John isn’t just a collector of planes – he holds a pilot’s license and flies on his own most of the time. Although this spectacular Boeing 707 was his brainchild, it’s not in his possession anymore. He donated it to the Historical Aircraft Restoration Society. However, don’t think that John doesn’t have anything to fly in. He has 4 more airplanes in his own hangar, all of which are worth more than $50 million together. 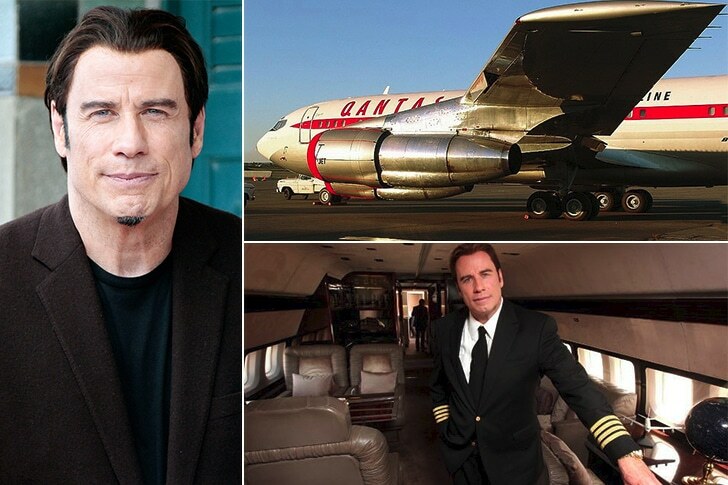 We can’t imagine how fun would it be to ride in a Travolta-piloted plane.